During my years as a tile setter and contractor I’ve used a number of liquid waterproofing membranes in showers that I’ve built, and all of them seem to do the job well. However, Laticrete International of Bethany, Connecticut, has come out with a product that does it with style. Hydro Ban waterproofing membrane is very easy to apply with a brush, trowel, roller or sprayer. 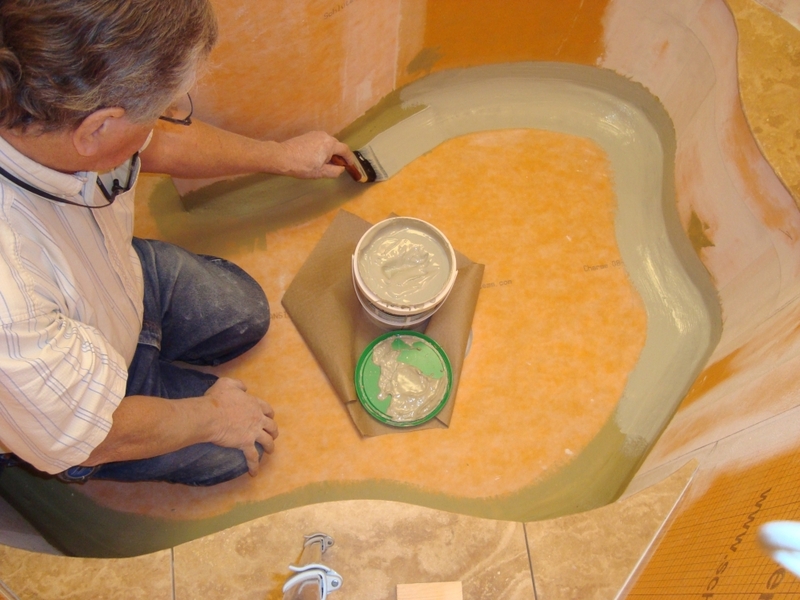 Unlike other liquid waterproofing and crack isolation membranes, Hydro Ban does not require that reinforcing fabric be used at corners and joints, so installation time is reduced dramatically. Additionally, the Laticrete product is fast drying. 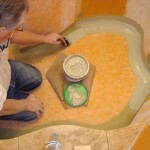 Shower floors, for example, can be flood tested just two hours after the final coating. Because Hydro Ban remains somewhat flexible, when used as a crack isolation membrane it accommodates substrate movement (expansion, contraction, shifting) up to one-eighth inch. If a floor, for instance, is going to move more than that you’d better not install tile or stone on it. Consider laminate or carpet. Hydro Ban is tenacious and bonds easily to wood and concrete substrates and to metal and plastic piping and plumbing fixtures. Thin-set mortar, the “glue” of the tile and stone setting industry, bonds directly to the membrane. For additional information on Hydro Ban and other quality Laticrete products, please visit the Laticrete web site. And, of course, you’ll always find authoritative advice and help at the John Bridge Tile Forums.